The Smartie is a British institution. Almost 17,000 are consumed every minute. Virtually any child in the country must be able to identify the cardboard tube, the saucer-shaped coloured sweets and the distinctive crunch of the coating. They were invented at a time when additives and preservatives were widely used, and nobody gave much thought to the ingredients listed on the tube – a concoction of milk chocolate and sugar laced with colours (E171, E124, E104, E110, E122, E133, and E1202). Later, when worries about e-numbers emerged, parents began to ask themselves whether the additives in chocolates like Smarties were affecting their children’s behaviour. 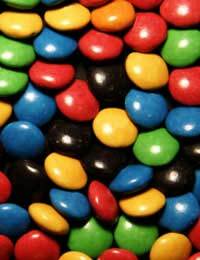 Smarties come in a range of colours, which has changed over the years, and has included blue, brown, and orange. The orange Smarties are the only ones to be flavoured to match their coating. Brown Smarties were once filled with coffee chocolate – but this didn’t go down well with young Smartie fans. For a short time, white smarties – decorated with pink faces – also appeared in Smartie tubes. This was part of a marketing campaign, which wasn’t quite as successful as the ‘Orange Thief’ campaign, where orange smarties were temporarily removed from packs until fans guessed the identity of the Thief. The blue Smarties were launched in 1989, an addition to the existing colours of Red, Yellow, Orange, Brown, Green, Pink and Lilac. By the late 1990s, health concerns were being raised over the use of ‘E-numbers’ in food, particularly foods designed for children. ‘E-numbers’ was the informal name for additives which began with the letter E – including preservatives, colourings, flavourings, thickeners, emulsifiers and stabilisers. The letter ‘E’ indicates that the chemical has been approved for use in Europe, but critics were quick to identify their dangers. Studies linked e-numbers to hyperactivity in children, and in the US they were even linked to cancer. Parents were reporting changes in their children’s behaviour after they’d eaten brightly coloured foods. Several E-number colourants were identified as being the potential cause, including E122 (red), E110 (sunset yellow) and E124 (ponceau). As a result of all this, many leading food manufacturers and retailers began to eliminate E-numbers from their products. In 2006 Nestle, which had long before bought out Rowntree, responded to concerns over e-numbers by making Smarties completely free from artificial colouring. They sourced natural colours for most of the Smarties, including Cochineal (from an insect) for the Red Smartie. Unfortunately, Nestle was unable to find a natural colouring for the Blue Smarties. This meant the company was forced to remove blue smarties from the tubes. They were replaced with white smarties, in line with the new all-natural campaign. The new blue Smartie is coloured with seaweed extract called spirulina. This extract is full of vitamins and minerals, which makes the Blue Smartie better than ever before! It’s good news for the hundreds of online campaigners who have been demanding the return of Blue... and it’s even better news for parents.